Trying to find a 1948 Leaf Football wrapper has proven to be far more difficult than one would expect. Given the nearly endless offerings of Bowman wrappers from the early to mid 1950's, the dearth of Leaf wrappers is somewhat surprising. Over the past several years, I've seen one made available and that was part of a larger lot of wrappers from the era. The actuallity of it being 1948 versus 1949 is still up in the air as the images provided were not of high enough resolution to decipher. Speaking with other collectors, I have been advised of two other 1948 Leaf wrappers that definitely exist in the hobby. I'm sure that there are others, but I have yet to scour deep enough to unearth them. Recently, an initial portion of one of the largest hobby collections, The Dreier Collection, was offered for auction by Chicago-based Legendary Auctions. Amongst the items were to interesting lots. The first was a nice run of football wrappers, albeit without a 1948 Leaf. 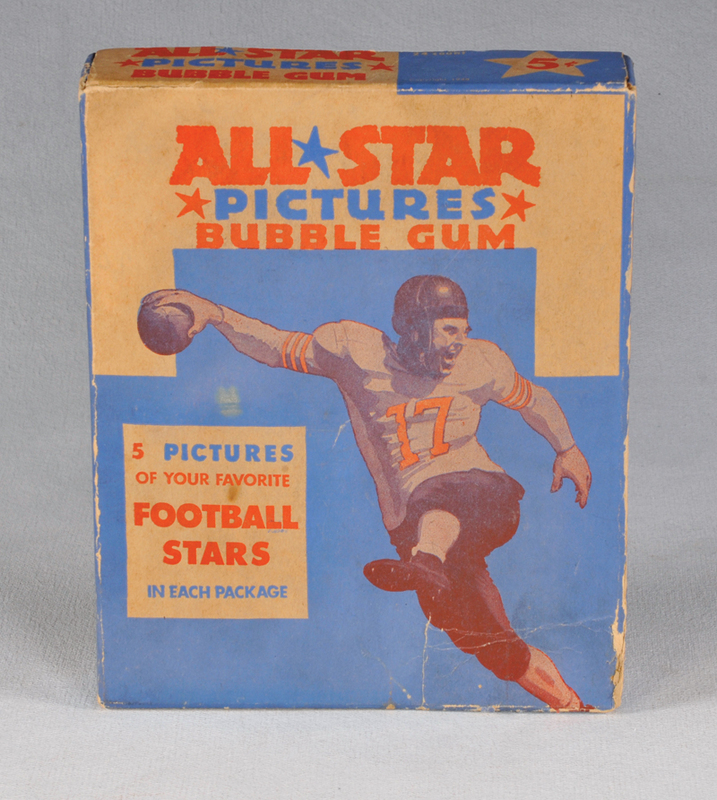 The second, and the most startling, was an original 1948 Leaf Football display box. Now, consider for a moment, the scarcity of the wrappers from this issue and perhaps you can fathom the magnitude of such an item being presented. Until the auction, although some knew of this box residing with the Dreier's, the existence of this item was akin to the existence of a unicorn. Was it a myth or was it real?